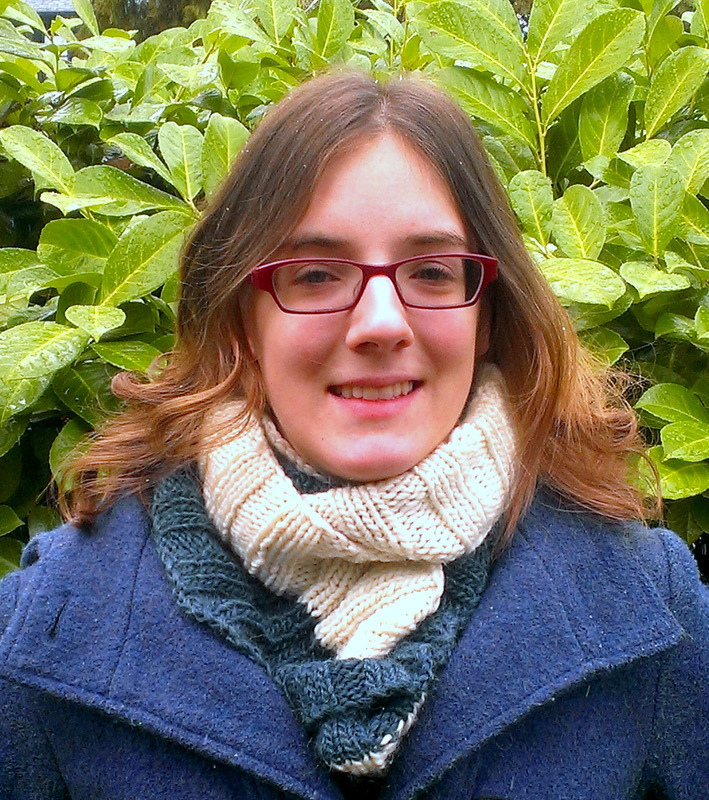 Over the Christmas holidays I knit a number of cowls as Christmas gifts. (You can see them here.) Two of them were knit from a stash of Rowan Cocoon that had been sitting around my house for years. I knit a third Cocoon cowl while in Vancouver, for my daughter Leah, but never wrote a post about it. This is because I finished it on the 2nd of January, just hours before hopping on a flight back to the UK. It was dark and rainy at the time and I couldn’t get a photo. A few weeks ago, Emma sent me some photos she had taken of Leah wearing the cowl, which means that now, in the pursuit of full disclosure, I can show them to you. I had one skein of Cocoon in a nice cream colour and one in a teal blue. I used a US 10.5 needle and cast on 180 stitches in the cream, joined in the round and then knit in 3×3 ribbing until I ran out of the cream yarn. 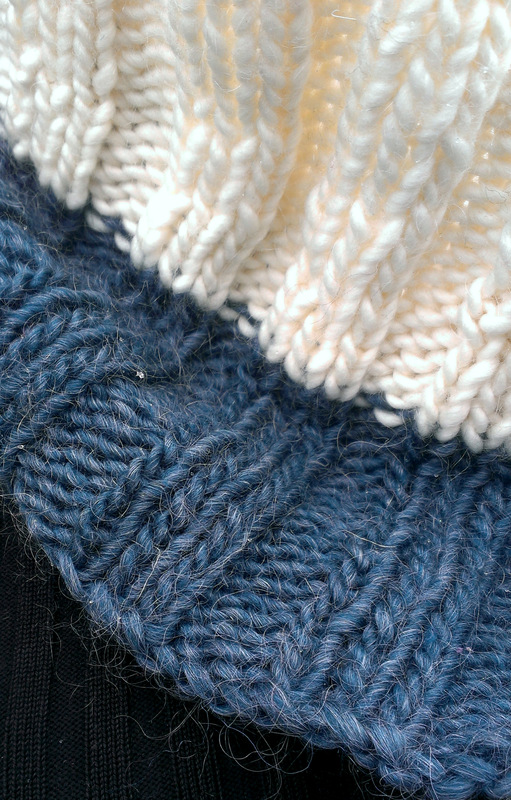 Then I switched to the blue and knit until I had enough yarn left over for the cast off. When it is twisted and wound around the neck, the blue and cream portions flip around each other in an eye-pleasing way. I knit this without a pattern and didn’t take any notes so I can’t even give you finished dimensions. It literally went from my needles to Leah’s neck (it didn’t even need blocking). It has been cold in Canada this winter, so it has received a lot of wear. I believe it ended up about 8″ wide, and it is long enough to wrap twice around. 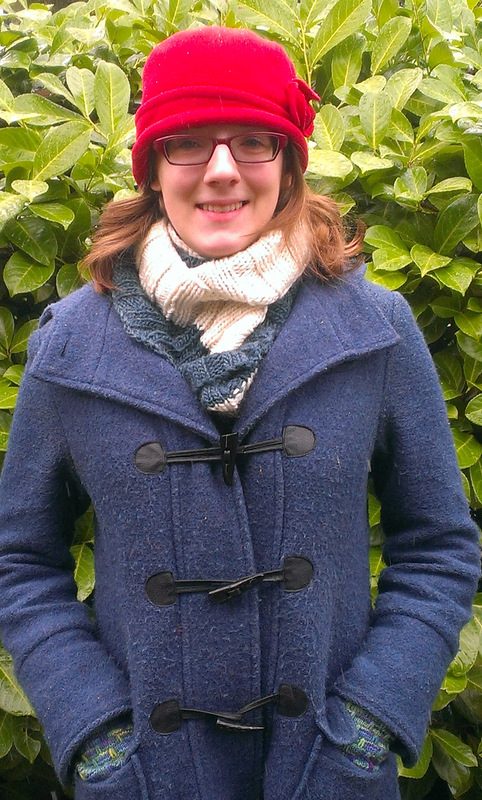 It is an extremely quick and mindless knit, and produces a warm and cozy cowl. You can just make out in the above photo the hand-knit mitts that Leah is wearing (they are these ones). What lucky daughters I have! I am in the enviable position of having three more finished projects to show you. Yes, you read that right – THREE projects off the needles!!! (And if I do say so myself, they are pretty great.) I will try to find time to get them blocked, photographed and written up as soon as possible. But my next three posts will have finished objects in them. Hey, this post does too! I may set a record here! This entry was posted in Finished Project, Main and tagged Knitting, Rowan cocoon by knitigatingcircumstances. Bookmark the permalink. Nice cowl! And sounds like I could knit that. I dropped everything to knit 2 quick scarves for the Boston Marathon Scarf project. Old South Church always has a service the day before the marathon to bless the runners and this year they are collecting blue and yellow (marathon colors) knit and crocheted scarves to give the runners at the service. Knitting with a purpose- love it. Sorry to get off topic. Do either of your daughters knit? Hi Jos, I heard about the Boston Marathon Scarf project; I’m glad you could participate. Both girls knit well, but don’t seem to be smitten, as I am. So happy you’re being so prolific, and find time to blog about it as well! Something had to give this winter, and blogging was my “it”. To say we’ve had a hard Canadian winter is an understatement. We have a forecast low of -21C for tomorrow night. We have over a meter snow accumulation outside, and that does not include the drifts. It’s been a very, very hard winter and we’re all buckling under the oppression. Thank goodness for wool. Enjoy your balmy days and verdant scenery. To think it’s a 6-hour plane ride away makes me want to pack my bags in three…two….one. I don’t know how you guys have managed this winter. Every time I see the weather report for Canada it gives me the shivers. I think I’d do nothing but drink hot cocoa for months. I tried the hot cocoa cure one winter. The end result (pardon my pun) was not pretty. It took a lot of walking the rest of the year to get the winter chub off!